New York - A Sanitation Bill introduced by Assemblyman Dov Hikind (D-Brooklyn) to help eliminate false sanitation tickets has just passed the NY State Assembly by 101 to 3 and now awaits approval of the NY State Senate. The proposed legislation will require DSNY agents to photograph and document the condition of a property at the time a sanitation ticket is issued. 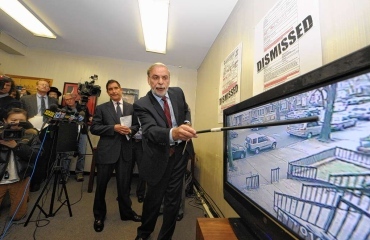 Calling the bill “the antidote to bogus tickets,” Assemblyman Hikind proposed the legislation only four months ago after proving that DSNY sanitation workers were purposely or carelessly issuing expensive tickets to his constituents and other New Yorkers. Three NY City Department of Sanitation (DSNY) agents were captured on surveillance video in Brooklyn issuing fraudulent tickets. “Today, we’re one step closer to making the ticketing process for sanitation violations as fair as possible to home owners and business owners,” said the Assemblyman. The Hikind legislation (#8968-B) will require sanitation agents to carry a mobile device that will allow them to take photographs with a time and date stamp of sanitation violations, and upload the photos and accompanying summons to a central database. While I agree with the proposed measures, you can be certain the cost of the summons will increase to reflect the purchasing and maintenance of the Camera systems the agents will have to carry. This act will benefit allot of yidishe homeowners so he is a "osek b'zorche zibur"
Who are the 3 geniuses that opposed it? why go thru all the headaches of changing the law and issuing the retards cameras etc. Just fire the bums who issue the fake tickets, and watch how the rest of the retards take heed. none of these bozos want to lose their cushy city jobs.